The following was originally published by ThinkProgress on September 30, 2017, and was co-written with reporter Joshua Eaton. 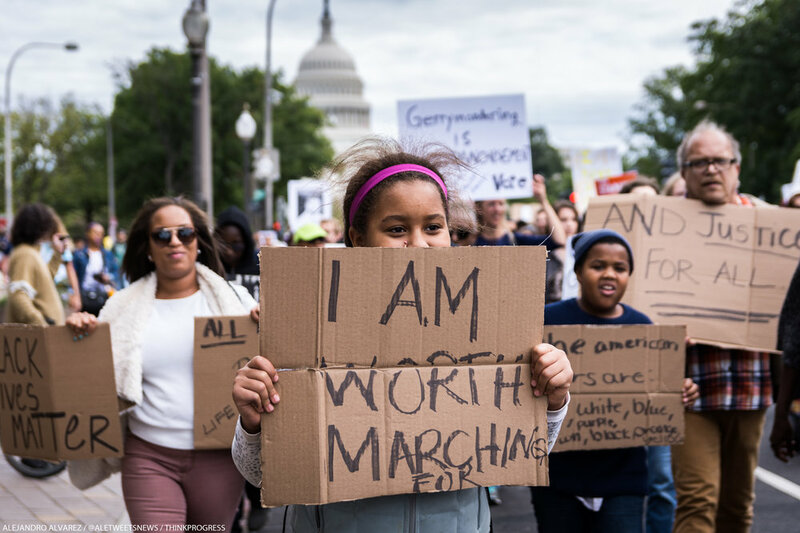 Thousands of people rallied for racial justice in the nation’s capital on Saturday as part of the March for Racial Justice and the March for Black Women. The two rallies, which were organized separately but in close coordination, took place in different nearby parks before meeting up to march past the Department of Justice’s headquarters and onto the National Mall, where marchers heard from feminist activist Gloria Steinem, Muslim rights activist Linda Sarsour, and Philando Castile’s mother Valerie Castile. Philando Castile’s death at the hands of a Minnesota police officer in July 2016, and the officer’s acquittal in June, served as the impetus for the March for Racial Justice, according to Maurice Cook, one of the organizers. The issues that brought protesters together Saturday long predate the Trump administration or the Black Lives Matter Movement, Cook said. But the president’s recent rhetoric — including harsh criticism of black NFL players who take a knee during the national anthem to protest police brutality, and reticence to condemn a neo-Nazi attack in Charlottesville, Virginia — was at the forefront of many protesters’ minds on Saturday. “Under eight years of [President Barack] Obama, the racists held their tongues,” Mike Coleman, a 64-year-old D.C. resident, said as he stood in Lincoln Park, where March for Racial Justice participants rallied before the march. Leaning on a cane and sheltering his eyes from the early fall sun, Coleman said he believes President Donald Trump has emboldened people who want to reverse the gains of previous civil rights struggles. Organizers for the March for Black Lives were careful to include a wide swath of movements at Saturday’s event, from Black Lives Matter to immigrant movements to Muslim rights to indigenous rights to LGBTQ issues and women’s issues. Tayac is a member of the Tayac Territory Singers, who drummed and sang songs in honor of Standing Rock, imprisoned native activist Leonard Peltier, and the American Indian Movement before the March for Racial Justice commenced. Deborah Zavos, 59, of Kensington, Maryland, stood beneath the trees in Lincoln Park wearing a colorful prayer shawl and yarmulke. Zavos said that she “never, ever, ever” misses synagogue on Yom Kippur, an important Jewish holiday that fell on Saturday focused on atoning for sins. But the March for Racial Justice was too important to the school social worker after years of working “right in the middle of the school-to-prison pipeline,” as she described it. “I’ve seen too many young black teenagers go to jail,” Zavos said. The march wasn’t always so inclusive. Farah Tanis says March for Racial Justice organizers initially appeared to ignore the case of Charleena Lyles, a pregnant black woman who was shot and killed by Seattle police in June. Caught between a march for black lives that ignored women and other protests like the Women’s March in January that she said ignored black issues, Tanis and others decided to organize a separate march to put black women at the center. That meant talking not just about police violence, Tanis said, but also about reproductive justice, sexual assault, poverty, access to health care, and more. After some conflict and reconciliation, Tanis said, the two marches decided to rally separately before joining forces. While the March for Racial Justice began with a rally in Lincoln Park, the March for Black Women convened in nearby Seward Square. After the rallies, they met to march together to the Department of Justice and rally on the National Mall. Opal Tometi, one of the co-founders of the Black Lives Matter Movement, spoke to the hundreds of black women gathered in Seward Square at the March for Black Women’s rally. “Contrary to popular belief, Black Lives Matter was created for black women — for all black lives,” Tometi told the crowd. Park Cannon and Renitta Shannon, two Georgia state representatives and members of the Georgia black legislative caucus, traveled for hours to be at the march. Both welcomed the decision to start separately from the March for Racial Justice as necessary to promote black women’s voices in a rapidly evolving conversation. After the morning rally, a drum corp lead about 1,000 protesters with the March for Black Women on a short march down North Carolina Avenue, chanting “black women matter” all the way, to join at least a thousand more protesters with the March for Racial Justice at Lincoln Park. With black women at the front of the crowd, the two groups made their way toward the U.S. Capitol. In a dramatic scene at the Department of Justice, protesters held up images of black men and women killed by police, saying their names one by one. “What does the Department of Justice owe black women?” came the call of one protest chant. “Everything!” came the response. In the aftermath of recent police killings, debates over access to health care, and a crisis in Puerto Rico with shades of post-Katrina New Orleans, people of color are organizing to demand more from a state that many of them feel is malicious and negligent. The March for Black Women, in particular, comes after changes to Obama-era Title IX guidance sparked outrage from activist circles who view it as an attack on survivors of sexual assault.